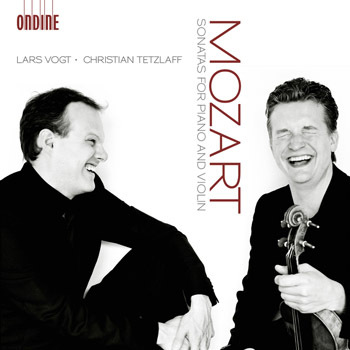 With this recording, Ondine releases the first chamber music CD with violinist Christian Tetzlaff, featuring his long time musical partner pianist Lars Vogt. The selection of these sonatas for piano and violin by Wolfgang Amadeus Mozart demonstrate distinctly the composer's ingeniousness and show a wide range and strong ambiguity of emotions. Mozart brought the genre to its first summit with a set of three sonatas, two of which are included in this release, B-flat major, K. 454 and in A major, K. 526. The third sonata in this recording, G Major, K. 379 belongs to an earlier set, which at the time excited a local critic: "These sonatas are unique in their kind. Rich in new ideas and traces of their author's great musical genius. Very brilliant, and suited to the instrument. At the same time, the violin accompaniment is so ingeniously combined with the clavier part that both instruments are constantly kept in equal prominence, so that these sonatas call for as skilled a violinist as a clavier player." Christian Tetzlaff has for years been considered to belong internationally to the very top of violinists, he also constantly has a most extensive performing schedule. Musical America named him "Instrumentalist of the Year" in 2005. His recording of the violin concertos by Mendelssohn and Schumann, released on Ondine in 2011 (ODE 1195-2), received the "Preis der deutschen Schallplattenkritik". 2013 will see a Schumann Sonata release by Tetzlaff and Vogt.